With emphasis on creativity, self-expression and learning, the School of the Arts provides dozens of opportunities for adults 50 years of age and older to discover hidden talents, hone an existing skill, learn something new or step out of their comfort zone. Small class size, a relaxed atmosphere and a focus on peer discussion is what makes the Cummings Centre an encouraging place to learn. The Wellness Centre is uniquely designed for older adults 50 years and older, keeping in mind that overall health and well-being is physical just as much as mental. Small classes, personal attention and monitoring set us apart from standard gyms. 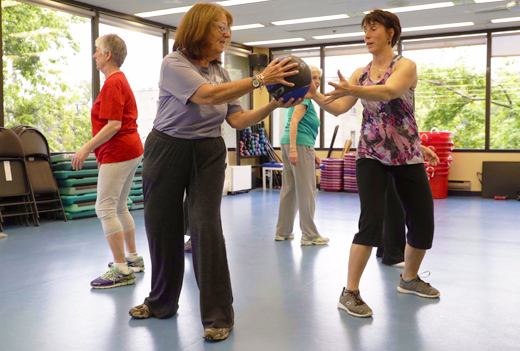 Individual programs developed by the Centre’s professionals emphasize brain health, physical movement, strength, balance, posture and flexibility. The focus is on empowering and maintaining general health and enhanced quality of life as well as prevention and rehabilitation of injuries, back and joint problems and fall prevention. Volunteer with us! Come share your time and energy while gaining new skills, making new friends and experiencing the joy of making a difference. Here at the Cummings Centre, we offer interesting volunteer opportunities with flexible schedules. You can tailor your experience to meet your needs. Give back to your community and contribute in a meaningful way. There’s no limit to what you can do! There are new and exciting volunteer opportunities awaiting you. The Social Services Department is committed to enhancing the quality of life of older adults. We all struggle with the reality of aging, be it ourselves or our loved ones. Whether we’re worried about the challenges we will face in the future or those we are already facing today. The Cummings Centre professional Social Services team is trained to provide you with the support you and your family need. We listen to what is going on in your life, either as a senior or, someone caring for a loved one. We see the bigger picture so we can help you make the best short and long-term choices. The Cummings Centre is back for another season of innovative entertainment, lectures and Speaker Series featuring the brightest and most engaging Speakers and Entertainers both locally and abroad. The Cummings Centre’s mission is to empower and enhance the quality of life of adults age 50 and over by providing dynamic and innovative programs, social services, and volunteer opportunities in a vibrant, respectful, inclusive and compassionate environment. Building on its Jewish heritage, Cummings embraces people from all ethnic and socio-economic backgrounds. As the hub of Montreal’s 50+ community, the Centre touches the lives of 10,000 people on an annual basis. In addition to its main campus at 5700 Westbury Avenue in Montreal, programs are offered at several off-site locations including the West Island, Côte Saint-Luc, St. Laurent, Westmount, Chomedey and Florida. The Centre offers more than 300 programs each season specifically designed for the 50+. A varied roster of educational and stimulating courses speaks to the vibrancy of the Centre and its commitment to embracing this age demographic. Pro­grams are designed for members to continually challenge themselves by learning, experiencing and sharing. The main campus building includes a state-of-the-art Wellness Centre and workout facility, a fully equipped art studio, a computer tech centre, meeting rooms, cafeteria and more. Adapted programming is also available providing in­novative art, fitness and social programs for individual’s recovery from surgery, with mobility problems and movement disorders including Parkinson’s disease, post-stroke, MS, aphasia and other conditions. The Cummings Centre boasts a volunteer corps of 900, ranging from 12-99 years of age, who are involved in all aspects of Agency life and are instrumental to the vibrancy and growth of the Centre. Volunteers play an integral role in the day-to-day functioning and success of the Centre finding great fulfilment in their roles. Additionally, a Social Services Department aims to enhance the quality of life of older adults and their families through the provision of a full spectrum of programs and services that support aging with dignity and maximizing independence. The Cummings Jewish Centre for Seniors Foundation, in part, provides the financial resources necessary to enrich the quality of life of seniors by supporting projects and activities that promote excellence in healthy aging. Come experience something new at the Cummings Centre. For more information, stop by, take a tour, pick up the new Guide or contact us at 514.342.1234. Check the footer of the website to see our Annual Report. Manager, Facilities: Guila Abecassis, B.A. The Cummings Jewish Centre for Seniors Foundation raises funds to enrich and safeguard the quality of life of the growing senior population served by the Cummings Centre. Stay in touch by signing up for our newsletter Enter your email to receive electronic messages from The Cummings Centre, including invitations to programs and events, newsletters, updates and other communications. You can unsubscribe at any time.